EDMONTON - As long as there is time left on the clock, its tough to count out Edmonton Eskimos quarterback Mike Reilly. Reilly ran in the winning touchdown inside the three-minute warning and passed for another as the Eskimos won their third game in a row, emerging with a 26-19 victory over the Saskatchewan Roughriders on Thursday. Riders head coach Chris Jones said that Reilly just seems to find a way in pressure situations. Jones felt his team let a winnable game get away from them. 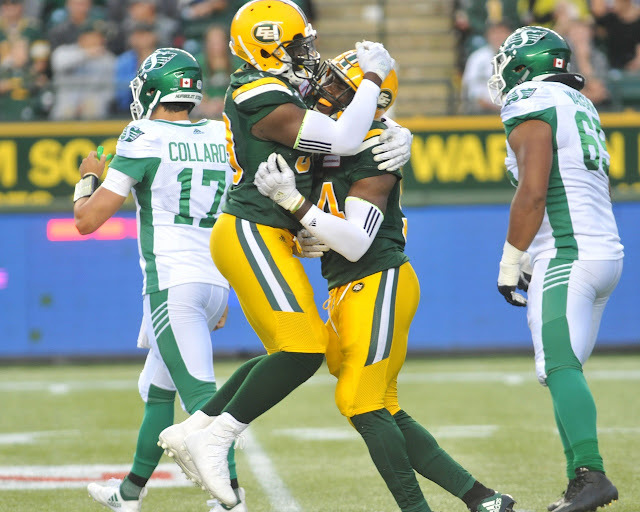 The Eskimos (5-2) started off the scoring with a rare first-quarter touchdown, as a 61-yard passing play from Reilly to Derel Walker set up a three-yard TD run by CJ Gable. Saskatchewan (3-4), which saw the return of starting quarterback Zach Collaros after missing the last four games with a concussion, tied the game up late in the opening quarter on its third attempt from the one-yard line, finally taken in by Marcus Thigpen. Edmonton regained the lead on a 48-yard field goal by Sean Whyte, the only scoring play of the second to make it 10-7 at the half. The only other notable moment in the quarter was Maas taking out his frustration on a Gatorade cooler. Saskatchewan took the lead early in the third on a 41-yard TD pass from Collaros to Duron Carter. Edmonton came roaring back as Walker made a circus catch in double coverage for a 36-yard major. The Riders looked to regain the lead late in the third quarter, but another third-down gamble from the one was stuffed just short by the Edmonton defence upon video review. Edmonton conceded a safety on the next series, to lead 17-16. After having what looked to be a 97-yard TD pass to Duke Williams taken away upon another review, Eskimos receiver Nate Behar then fumbled, leading to a 33-yard Brett Lauther field goal. The Eskimos put together a long drive late in the fourth, with Reilly taking it in from the one with 2:23 remaining, but the two-point convert missed. Saskatchewan failed on a third-down gamble, allowing Edmonton to put the game away with a 46-yard Whyte field goal. The Eskimos are in B.C. to face the Lions next Thursday, while the Riders have a bye week before hosting the Calgary Stampeders on Aug. 19. Notes: Saskatchewan cornerback Nick Marshall came back from the six-game injured list with a finger injury, meaning that receiver Carter was able to return to the offence after subbing in on defence in Marshall's absence. Carter was the Riders leading receiver last season with 73 catches for 1,043 yards and eight TDs. - I've gotta do a better job of coaching them. We've got to be more disciplined. That's what this crew calls (line of scrimmage penalties) and that's what we got called for. - We didn't have Elam on the roster and that's only the second time that's happened in my career. We went to our one-man down situation, and then after we had to go two-down, we went with Toby at safety and got through it. - We've got a long ways to go in all three phases. When you have the lead in the fourth quarter, you need to keep it. They made the plays to take it back. We also need to give Zach enough protection. He's not going to get out of the pocket. He's going to stand in there and find guys. We need to get executing at a high level. We know good and well we can beat teams like Calgary and Edmonton. It's there, but consistency is key. - As far as the bye goes next week, we already have broken down every game of every team in the league. Now we're just waiting on the most current games. This upcoming bye is the players' last chance to get away from football and the pounding on their bodies. Then it's 10 or 12 straight games which is what I like. - We were pretty good with injuries. Thiggy was hampered by a groin all week. Brouillette got hurt on the first play and then was gone the rest of the game. Other than those two, we came out pretty good. - We didn't execute to the point we wanted to. We had opportunities. The defense played their tails off. I fumbled on 2nd-and-1 at their goalline. From a comfortability standpoint together, it was good. We did good things and are really close to being where we want to be on offense. - We ran the football pretty well. There were some reads I would've changed but again, we're a hard-working group. I feel like we're right there. The CFL is a long season and we have 12 more left. We're excited to get back after the bye and get back to work. - You need to enjoy the bye and see family but you need to stay in the playbook and do your weightlifting and nutrition. This game is a game of attrition so you need to stay in the best shape and healthy. Riders 1st and 10 from Esks 16 and can't get in the end zone. They end up lining up for a FG before being GIFTED a fresh set of downs thanks to a penalty. 1st and goal from the 4, holding penalty takes them back to the 14, end up with two cracks at the end zone from the 1. First play was a fumbled snap, 2nd they got stopped and turn it over. That can't happen. Usual story...amazing D, strong special teams, weak offense. This was a very entertaining game(2ndhalf) what an amazing effort on both sides of the ball. I have no complaints but that phantom reverse call on our touchdown left us in shock. I can't believe head office would overrule 2 referees that were right there!!!! How does that make those referees feel? Worst call of the year. But aside I love the way we battled on both sides of the ball. Zach played fine the team just looks different but confident so it only gets better. I can't wait to get them back here. This game was a nailbiter right until the end that reverse call on the goal line was the RIGHT call from that one angle it clearly shows watford knee was DOWN even the TSN guys drew the line for you riders fans to show the truth .Wow that riders D is tough but Reilly the MOP that he is found a way to pull this one out,just a comment that before the D line starts pounding its chest about the 4 sacks just remember that Esks were missing there massive Center in Sorensen and had to move Beard over to play the centre position thus having 2 O linemane out of place and that disrupts the chemistry on the Oline ,just as you riders say it does when that happens to you.At the end of the day though this was a very ,very, tough hard fought battle.Congrats to both teams on the outstanding game. I would call this a High School offense but that would be an insult to High Schools everywhere. Amazingly they still had a chance to win the game but the DB's broke down... again! They blitzed 2 out of 3 times in the first half and Reilly only completed 4 passes. Decided not to do that with the game on the line. Makes sense to me!! Very exciting game. What a difference a week makes. D played very well at times, and at others there were breakdowns. Much stronger on offense than the week before. Zack did a good job of releasing quickly on his passes. Still confused about some of our offensive play selection. Goal line plays need much work. Penalties killed us at times. Need to use our best two offensive weapons (Carter and Roosevelt) much more. Liked the two running back show much more than the three. More flow. Good game but hard to beat the top teams with a ball control offence unless you have the best short passing game in the league. Which they don't. Their score was a bomb to Carter. Who f-----d up the roster and left Elam off? So stupid. Lots of frustrating moments in a game which was there for the taking but hats off to Riley and the Eskimos who did what they needed to do at the right time. Seems like Riders have had goal line and short yardage issues for years to the point where I cringe whenever we're 1st and goal from the 1. All in all though while the team has lots to work on I think it is moving in the right direction and will gain momentum in the coming weeks. Don't forget Rider fans, the Montreal train wreck beat the green train wreck. This team is 3-4 so accolades are not deserved whatsoever. They from all indications, will struggle to be a .500 team considering all the western division games it has to play. Every week it's something new that bites them. There very clearly are some coaching issues and that includes the HC. Mostly though the others on his staff are not getting it done. One week it's special teams and the next week it's defence, followed by offence having their turn. Sadly this team has not come close to living up to the expectations that so many hard when Jones was hired. Right or wrong the flaming bag of crap will end up on his doorstep. This team was supposed to be championship calibre team by this third year. Honestly the team looks like anything but that. The big unanswered question is why?. It’s easy to make all kinds of promises when you are first hired. Living up to those promises is a whole different scenario. Yes the Riders almost got to the Grey Cup last year through the back door. That would have been a bonus in the second year. This 3rd year is hard to swallow. The club has maxed out the cap and couldn’t make moves. That is until Jerome Messam was released. Then like a jack popping out of his box. Collaros and the corner boundary rookie were both magically pulled off the 6 game injury list. What’s really sad is that the Cap is riding the razors edge and Jones was willing to sit the starting QB due to a lack of funds. Jones is making so much money, compared to NFL it’s peanuts, and it seems the coaching staff put in a lot of hours. Let’s appreciate the positive, the defence is mostly awesome, sure they will make mistakes, butthe guys they are going up against are good as well. Offensive play selection could be better, lates start stretching the field. For one who didn't expect a win IN Edmonton I was not disappointed with what I saw. Hate to lose of course ... but ... once over that I realize there is some real progress happening. The D is there! The O isn't. But the O will come. We lost our starting QB folks! Expectations were way too high under those circumstances. Let's see what we do with our starter.